Dr. Eva-Elvira Klonowski immigrated to Iceland in 1981, after the declaration of martial law in her native Poland. 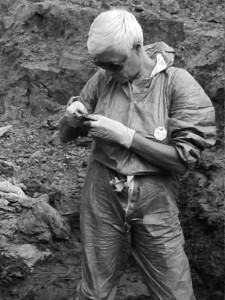 A leading professional in the field of forensic anthropology, she was part of the first forensics team assembled by the International Criminal Tribunal for former Yugoslavia to exhume and identify the remains from mass graves. Since 2001, Dr. Klonowski has worked for the International Commission on Missing Persons (ICMP), an intergovernmental organization addressing the issue of persons missing as a result of the conflicts in the Balkan region. In December 1981, when Eva-Elvira Klonowski, her husband and their young daughter were on vacation abroad, the Polish government, led by General Jaruzelski, declared martial law. Polish borders were closed and all communication with the outside world was prohibited. The young family became accidental refugees, finally landing in Iceland in 1982. Through her work at the department of forensic medicine in Reykjavik, Eva-Elvira specialized in the emerging field of forensic anthropology. A turning point in Evas career came in the summer of 1996: the first four mass graves had been discovered in the village of Kalesija in the former Yugoslavia. The International Criminal Tribunal for former Yugoslavia (ICTY) asked Eva-Elvira to join a forensics project to exhume and identify the remains of bodies found in the mass graves. She and her team worked in difficult conditions, putting up with the ever-present stench of rotting bodies as they worked in a bombed-out clothing factory which had been converted into a makeshift morgue. At the request of the International Commission on Missing Persons (ICMP), Eva-Elvira delivered a report she had prepared on the current state of existing forensic facilities in Bosnia and Herzegovina in the summer of 1996. After returning to Iceland in 1997, she then volunteered for the Bosnian State Commission for Tracing Missing Persons until 2000. In October 2000, she played a critical role in helping many families identify their missing loved ones, finally allowing the grieving families to bury their relatives properly.